Two healing guides visited me during a recent meditation. My eyes were closed, but I could “see” them clairvoyantly. Their sudden arrival took me by surprise, since I had not been expecting them. The first to appear, a male, stood to my left. A female then appeared to my right. They were traveling together as a team. Spirit guides often do this. Their clothing surprised me even more than their unexpected arrival. The male wore heavy black and purple robes trimmed with gold embroidery. The female was dressed in a full-length Victorian fashion and wore a large hat. Their attire startled me because guides normally come dressed in the same glowing white robes they wear in the spirit realms. I welcomed them and invited them to sit in the facing chairs on either side of me. They did so, and at once their thoughts began to flow into my head. They chose to communicate with me by thought rather than voice. I didn’t ask their names -- it didn’t seem important because we identify each other by vibration, not by name, in the spirit realms. My curiosity about their attire amused them. Spirit guides can appear to us in any form they choose. Or we may see them in a form we can easily relate to. This I have known for some time. They quickly dismissed my curiosity about their attire. Instead, they wanted to talk about healing. They began by reminding me that when we humans use the term healing, we normally mean “physical healing.” We do this -- they explained -- because we think of ourselves as physical bodies. 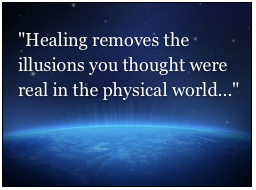 We believe that physical healing requires pharmaceuticals and perhaps surgery. They wanted me to understand that healing encompasses far more than just physical healing. It occurred to me to ask them about my own healing guide whom I have met on previous occasions. 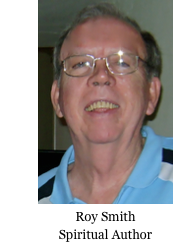 They explained that he had gone on an urgent mission to rescue a soul who had become lost somewhere between the physical and spiritual realms following physical death. “Your guide was planning to come with us, but the rescue mission required his immediate attention,” they told me. At some point during the conversation, they invited me to travel with them to the other side of the veil. There, they assured me, I could see first-hand what healing really means and how it really occurs. I expected them to take me to facilities and institutions of healing upon arriving. Instead, I found myself strolling with them through the same resplendent gardens I have visited so many times before. The air smelled of lilac. As we walked through the pristine gardens extending as far as I could see, they encouraged me to carefully examine the plants I saw around me. I noticed at once that the plants glowed with life and brilliant color, as if illuminated from within. They even emitted the gentle sounds of soft choral music that have captivated me during previous visits to these spiritual gardens. Nowhere did I see any plants that were dry, disfigured, or lifeless. They then urged me to look carefully at the many other beings strolling throughout the gardens. Like the plants, the beings I observed around us seemed to glow from light within. Spirit beings have always looked this way to me during my trips beyond the veil. That is why I have consistently referred to them as “light beings.” Without exception, the beings I saw there in the gardens appeared to be vibrantly healthy. We strolled for a while longer through the gardens as we continued to discuss these things. Eventually, they invited me to visit a healing center. I saw no medicines or medical devices anywhere. Rather, I saw attendants in the wards gently giving patients dosages of energy that flowed through their hands. “This is the only time healing is necessary here,” the guides told me. What I witnessed in this healing center was a form of spiritual healing very different from the chemical poisoning and barbaric surgery that we call medical care here on Earth. The center was not illuminated with intense white lights characteristic of hospitals on Earth. Nor did I sense the obnoxious medical smells that permeate earthly hospitals. I realized, of course, that our need for “modern medicine” on Earth arises from a belief that we are physical beings. I realized that the physical bodies encasing us are high-maintenance. They paused to make sure I understood. Then they continued. "Healing removes the illusions you thought were real in the physical world," they said. "By doing this, it restores your memory of what you really are: eternal spiritual beings who cannot become sick and who cannot die." The guides told me that this trip wasn’t just another diversion for me. Of course, they knew of my plans for an upcoming trip to Disney World and laughed. They told me they had, in fact, brought me here and had shown and explained these things to me, expecting me to take this knowledge back to the physical world and share it with others who might be ready to receive it. But as I had learned on previous visits to the other side of the veil, this sharing of knowledge between the spiritual and physical worlds is a two-way process. You see, many souls in Spirit are anxious to learn about life in the physical world. They may be preparing soon to incarnate for the first time. Or eons may have passed since their last incarnation and they may wish to be updated before returning again to the physical world. The healing guides said they needed to remind me of this because I have lately forgotten my function: to share knowledge on both sides of the veil -- at least until humanity realizes that the veil separating us from Spirit is just an illusion we created to make physical “reality” seem real and convincing. The two healing guides assured me that I am never alone in carrying out my function. They and many others -- including my primary guide Max and my personal healing guide -- are always helping me as I go about doing this. Before releasing me back to the physical world, the two healing guides also wanted to explain to me how we humans sometimes become lost between the physical and spiritual realms after our physical bodies die. This may happen when we do not know or believe that we are “dead.” Or it may occur because we are afraid of what will happen to us after death. So instead of moving on, we become lost. When this happens, soul rescue is necessary, followed by recovery and healing. At last, the two healing guides told me my visit had come to an end, and they gently allowed me to return to my physical awareness. Upon returning to the physical world, I wrote down everything I could remember, fearing I might soon forget it, just as I usually forget my nighttime dreams after I awaken each morning. It has since occurred to me that the healing I witnessed on the other side of the veil is strikingly similar to reiki and other forms of energy healing practiced here on Earth. In fact, I suspect that the various forms of energy healing we practice here have their true origins in the spiritual realms. In addition, it has occurred to me that an inflow of energy also sustains us here in the physical world. You might refer to it as cosmic, spiritual, or divine energy, as you wish. In any event, most of us are not yet aware of it, because we still rely only on our five senses to determine what is “real.” Of course, the physical density of the world and the blockages caused by our negative emotions do significantly reduce the amount of life-sustaining energy that can flow into us. To remove the blockages and experience genuine healing, we need to let go of the host of negative emotions plaguing us -- including, most notably, fear, anger, stress, doubt, skepticism, worry, guilt, and judgment. As we let go of these negative emotions, the amount of energy flowing into us can increase dramatically. And as the inflow of energy increases, our spiritual evolution will surge. We will go from living in spiritual ignorance and sickness to spiritual recovery. Our physical bodies will begin to transform into light bodies, even while we still live here on Earth. We will begin to experience healing and perfect health. Perhaps the best news is this: Right now, more energy is flowing into Earth and into us than ever before in history. This will precipitate humanity’s impending spiritual awakening. Thanks for sharing, Roy. What wonderful knowledge to have. Thanks for all you do. "most notably, fear, anger, stress, doubt, skepticism, worry, guilt, and judgment" It's no wonder the Bible says God has NOT given us a spirit of fear... all of these originate from the spirit of fear. And fear is a sure BIG stop sign to our life's success/journey. I'm so glad I found this page as I have been looking for confirmation of some healing energy work my spirit guardian was been doing on me last week overthe course of a few days. It really was a phenomenal experience and I was hoping to find others who had under gone similar treatment. I am actually a very active person. I cycle and walk a lot, for hours, but ever since the treatment my energy has been totally depleted as it's all being used up to realign my chakras and clear blockages, as well as work thhat was done on a weakened knee from all my cycling. I cried and laughed all the way thorugh the first hour treatment. It was a totally mind boggling experience. I hope others get the chance to experience it too. Thanks for you post. You've given me a lot of confidence to move forward with a more open and accepting heart as I embrace these very recent spiritual events and awakening. I am so glad that I am one of who is ready to receive this message. When I am reading this article and my body has reaction and I feel I am connecting...It all make sense now. It is time to bring love, peace, and harmony to the world!! !